Friday’s close looked very different from Tuesday’s open in which the Dollar broke down, Dow fell 130 points & the 10-year Treasury yield touched 2.09%. It was a morning when bad news about Hurricane Harvey & the missile launch by North Korea seemed to weigh down all markets. But they don’t call them turnaround Tuesdays for nothing. 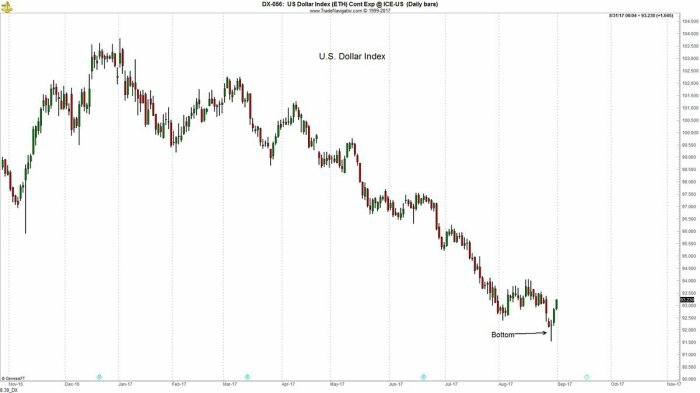 The Dollar reversed & went on to close up on the day and the week. 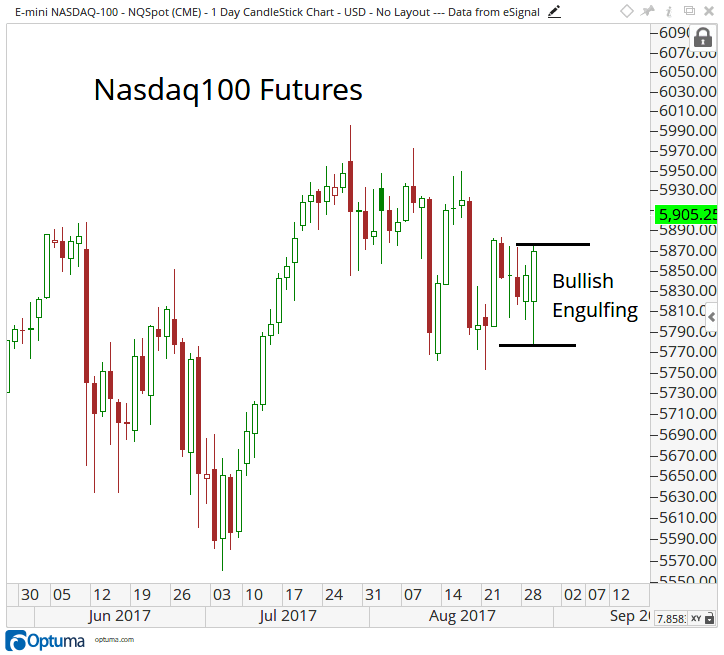 Stocks ended their consolidation and went on a rally led by the Nasdaq, the index that had suffered the most during the consolidation. True to form, construction & resource stocks exploded higher as they usually do after a major natural disaster. It was a broad-based rally in which both Amazon & Macy’s/Footlocker rallied, in which both copper-iron stocks & gold miners rallied hard. Emerging markets rallied hard & outperformed SPX by a 3:1 ratio. 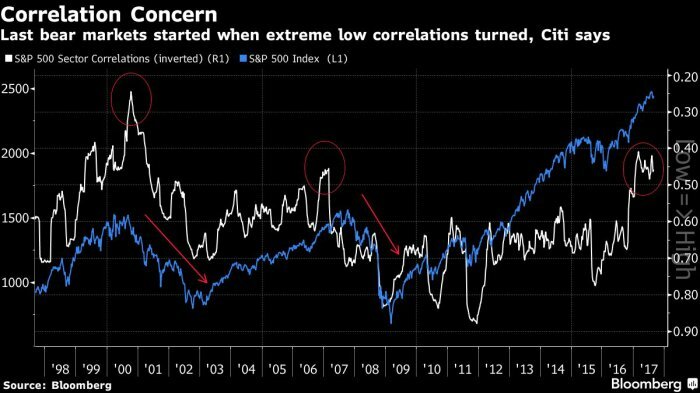 It was a perfect turnaround for Risk Parity funds with Stocks rallying, Treasuries (except the 30-year) rallying and Gold rallying hard despite a small rally in the Dollar. Treasuries rallied hard all week until the strong ISM number came in on Friday at 10:00 am. Despite the bounce back in Treasury yields on Friday afternoon, yields along the Treasury curve (except the 30-year) closed down on the week. Until Friday late morning, Treasuries seemed immune to strong economic data. The ADP 237,000 stunner, the revised Q2 GDP 3% number didn’t bother Treasury yields at all. The 10-year yield went down to 2.1% in the aftermath of the disappointing 156,000 NFP number on Friday. But it reversed soon after the strong ISM print at 10:00 am on Friday morning to close up 4 bps on the day. Despite that bounce, the 10-year yield closed down 1 bp on the week to 2.16%. The 2-5 year spread had dropped down to 37 bps on Friday morning. It bounced up to 39 bps by Friday’s close; still a low low spread. This shows that the markets just don’t believe the Fed will continue raising rates beyond the 1-2 rate hikes the market expects next year. Recall Dallas Fed president said a couple of weeks ago that he expects a 2%-ish terminal fed funds rate. 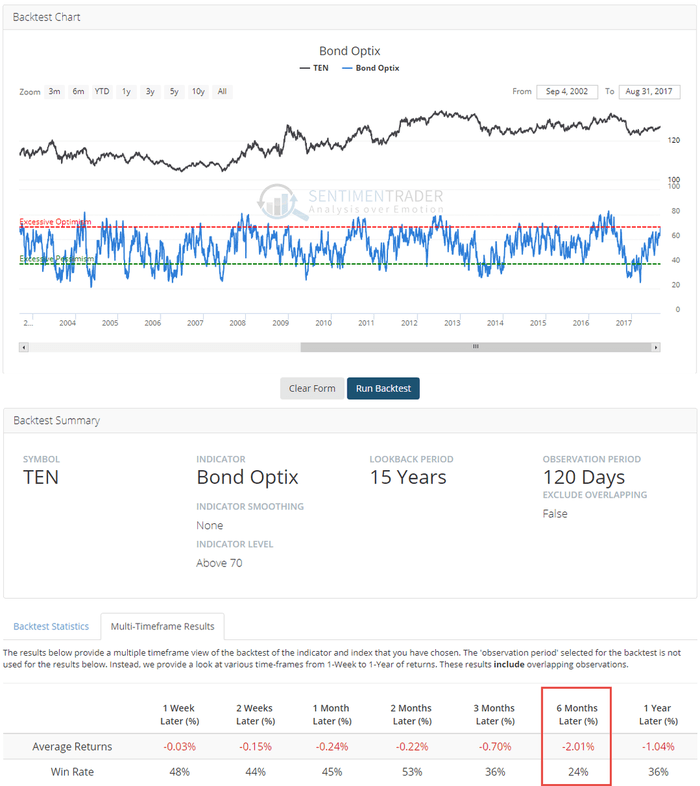 SentimenTrader‏Verified account @sentimentrader Aug 31 – When Treasury Bond sentiment has become this optimistic, the next six months have not had a pretty a risk/reward. The long end of the Treasury curve is more dependent on inflation expectations than on any other factor. And rents, a big component of inflation indices, are coming down all across America. What if growth expectations also begin to slide down despite Friday’s strong ISM number? . Lakshman Achuthan‏Verified account @businesscycle Cycle upturn we called last year is now about as good as it gets. Slowdown ahead. “Logically and empirically, recessions see much lower interest rates. Cycles associated with the 14 recessions since and including the Great Depression average a drop of 186 basis points in yield (-1.86% in yield) in the 10yr US Treasury. In the last five recessions that we have Fed Funds target data for, the Fed has cut rates an average of 625 basis points (-6.25%) and a minimum of 500 basis points (-5%)”. Perhaps that fear explains the bid under Treasuries despite the positioning. The Fed can change that on September 20 or sustained burst of strong data may. Historically, the aftermath of natural disasters like Katrina has been bullish for US stocks. The Congress is usually quick in voting spending bills to rebuild and that injection of money tends to make cyclical stocks rally as they did from Tuesday to Friday. Add to that the expectation, however modest, of a tax cut in the near future and we could see a strong rally into year-end. Ralph Acampora pronounced his target of Dow 22,900 by year-end on Friday and a number of gurus have 2550-2600 as their year-end S&P targets. 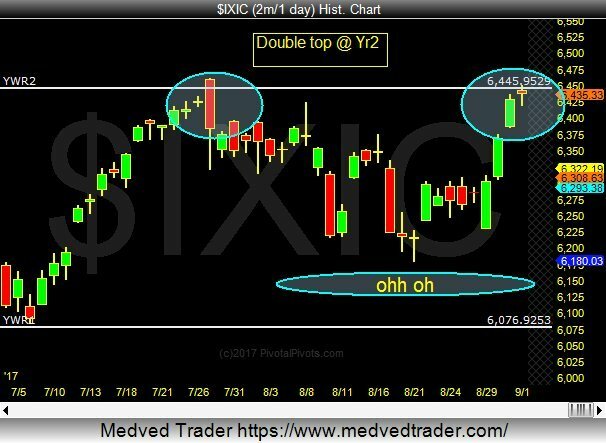 “This is the S&P500 and this month had something of a doji, where the close was near where it opened to begin the month. Traditionally this is evidence of indecision and normally seen at turning point. The positive here is that it went out near its highs and did close at a new all-time high. … As I’ve been saying, if we’re above that 2400 I think we need to continue to err on the long side for sure. This month it reiterated how important that level is and retested it successfully. … That 3000 target still stands out for the S&P500. 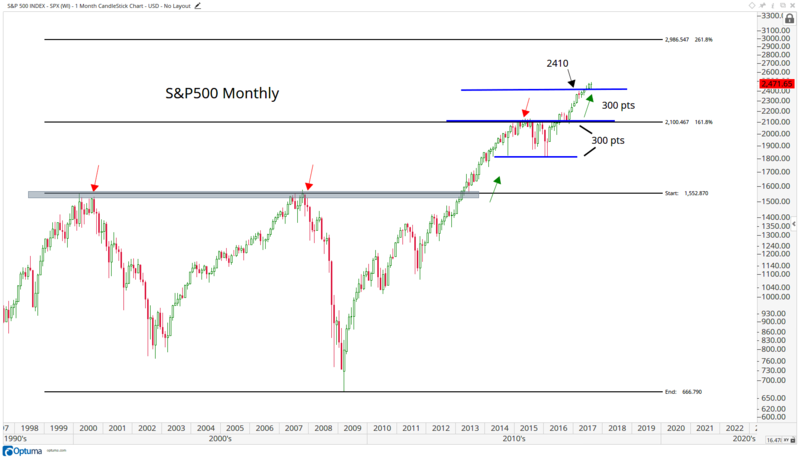 The 300 point base throughout 2015-2016 gave us a measured move target to around 2400. That was achieved and now exceeded. So if we are above that, we want to be big time long”. Is a cautionary section ever complete without an obligatory reference to 2000 & 2007? Last week, we spoke of inertia. Remember it requires a big force to overcome inertia & change direction. That force will have to first prove itself by forcing the S&P to decisively break 2,400 on the downside. Gold broke out this week above $1,300 with such power that Louise Yamada started talking about what happens if Gold breaks $1,400. Gold was up 2.6% this week with Silver up 4.3%. The miners were spectacular with GDX up 5.9% and GDXJ up 6.9% on the week. 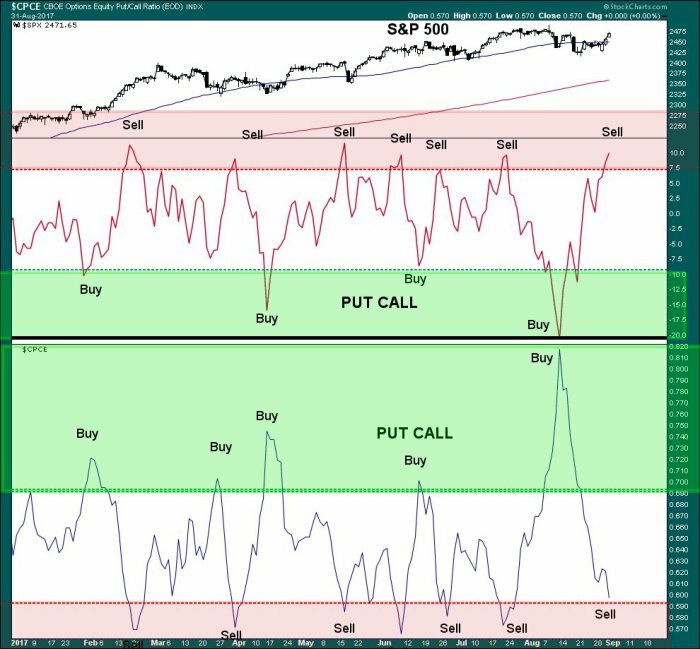 Carter Worth of CNBC Options Action told us to respect the momentum but some suggest short term caution while suggesting big intermediate term upside. “When the 2-week rate of change (ROC) moves up or down by greater than about 3%, that tends to mark an exhaustion point for gold prices. Sometimes the actual gold price top associated with that exhaustion arrives a few days later, but the point is that prices typically correct because they have outrun their fuel supply. … This current high reading in the 2-week ROC does not necessarily mean that the uptrend in gold has to be done. 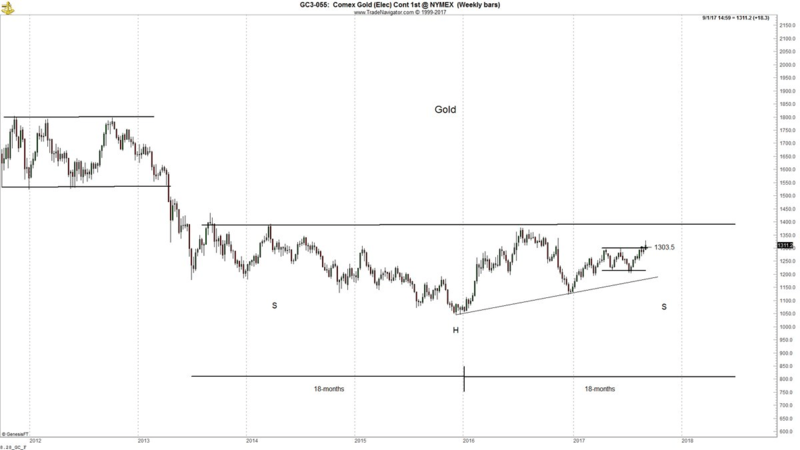 But it does say that gold prices have run pretty far and are vulnerable to a pullback“. Unprecedented is too weak a word to describe that happened to Houston & other areas of Texas this week. It is the absolute worst water disaster in America’s history. The economic damage is enormous but the human toll, thank God, is not that horrible. For a more detailed discussion about Houston, hurricanes & floods see our adjacent article – Nature to Houston – “Water Needs Space” – Netherlands Today & MIT of 1961. Rejuvenation follows disaster. That is the law of nature and also the law of human life. Now that Harvey is behind us, we need to look forward as markets have already done. So we wish all readers a very Happy New Year for this weekend. And what New Year are we talking about? The most important one at least from our point of view – the New Year of College Football. Last year’s season ended with a fantastic game and even more fantastic finish in the Clemson-Alabama national championship. We hope this season ends with even a better game. You know, what would feel great? If University of Houston wins their conference & gets into the playoffs.